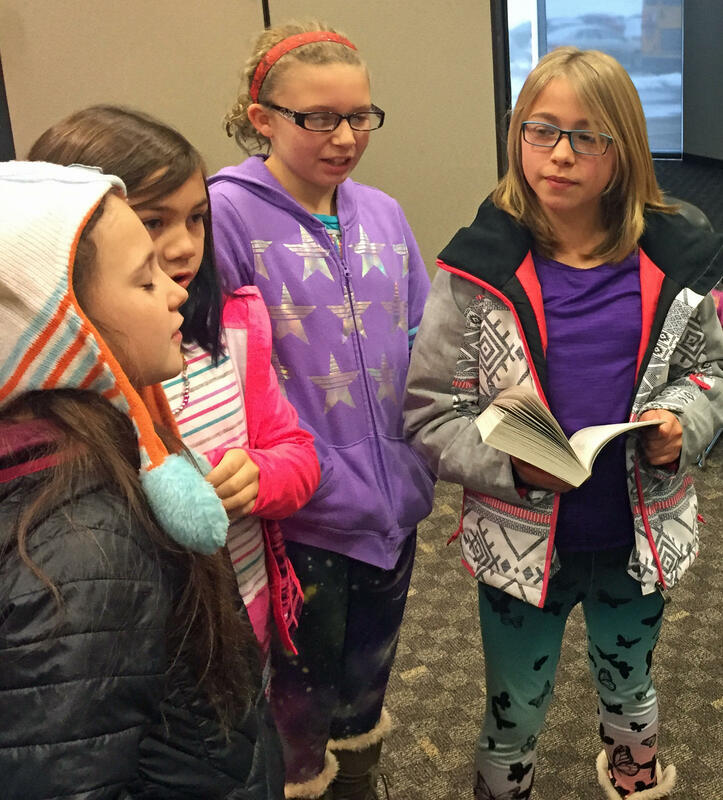 These Hyde Park fifth-graders took a bus ride to the Green Mountain Technology and Career Center to talk about "The Littlest Bigfoot" with a group of sixth-graders. The sixth grade is at GMTCC while Hyde Park Elementary School is undergoing renovations. If you were listening closely a few weeks ago in northern Vermont, you may have heard what sounded like a secret colony of "Bigfoots." But no, it was just a group of Hyde Park Elementary School students acting like the characters in The Littlest Bigfoot. And, really, there’s nothing to fear from any of the Bigfoots in Jennifer Weiner's novel, a current nominee for the Dorothy Canfield Fisher Book Award. The Bigfoots are not scary — they’re just misunderstood. So, naturally, these Hyde Park fifth- and sixth-graders have lots of questions for the author, starting with some terminology. First of all, people who study bigfoots, like the novel’s character Jeremy, will tell you the plural is "Bigfoots," not "Bigfeet." Well, that’s just what we "No-Furs" call them — oh yeah, in the book Bigfoots refer to humans as No-Furs. The Bigfoots also call themselves the "Yare," and one Hyde Park sixth-grader was curious about that name. Khalil Bridgman: "How did you come up with the name of the Bigfoot tribe, the Yare?" Jennifer Weiner: "Oh! What an excellent question! I don't even remember where that word came from. I have two kids – I have a daughter named Lucy and a daughter named Phoebe – and we have lots of made-up words. "One of them is the word 'nyebbeh,' which made it into the book. Where I would try to be combing Phoebe’s hair or I'd like poke her and she'd go, 'Nyebbeh!' and kind of brush me away. "I don’t know where Yare came from though; I can’t remember. Sometimes when you're a writer, your brain just kind of spits things out at you, and I think this was one of those, one of those cases." From left, Hyde Park students Mabel Leaker, Jenna-Liv Elliott, Ava Sandridge and Mara Bowers, work on their best Yare impression. One fifth-grader wanted to know why Bigfoots were Weiner's mythical creature of choice for this novel. Boden Mayo: "Why did you choose a Bigfoot for your book instead of like the Loch Ness Monster or something like that?" Jennifer Weiner: "I chose a Bigfoot because my daughter Phoebe became obsessed with a television show that was called Finding Bigfoot. And she watched every episode of this show and it felt like every time I would stick my head in the TV room, there would be a Bigfoot on my TV or like a Bigfoot track, or like a tree branch that a Bigfoot had broken. "So, I became interested in Bigfoots that way and if she'd been watching a show about the Loch Ness Monster, this could've been a very different project." Hyde Park Elementary School student Natasha Begin reads Jennifer Weiner's "The Littlest Bigfoot" during a silent reading portion of the event at Green Mountain Technology and Career Center. In The Littlest Bigfoot, that littlest Yare is named Millie. And she’s different from the other members of her tribe in many ways, including her big dream of singing on a television talent competition called The Next Stage. And Millie also isn't afraid of humans, despite hearing scary stories about the "Bad Red-Suit No-Fur" (whom you may know by a different name, especially in December), as well as the "Bad Fairytooth" and the "Neaster Bunny." Listen to the audio at the top of the post to hear Jennifer Weiner read an excerpt from The Littlest Bigfoot about the "Bad Red-Suit No-Fur." Another main character in the book is Alice. She’s a human from New York City who doesn’t really fit in with her peers either. She’s been to a different school every year, and has never made a real friend. She’s big and clumsy, and basically uncomfortable in her own skin. Fifth-grader Lucien Padulo recalls some of the ways the author describes Alice: "Her hands as big as ham steaks, and her crazy hair, and both of her feet look like one giant foot." 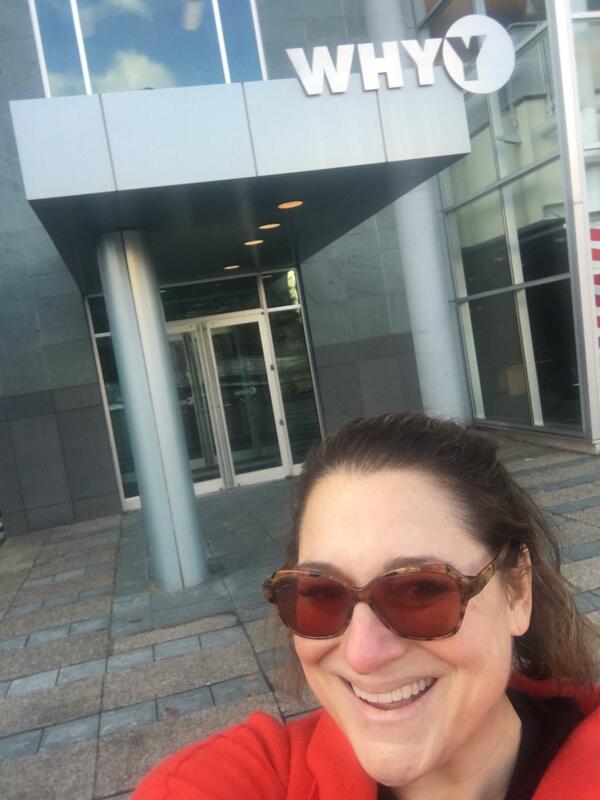 Author Jennifer Weiner stopped by the WHYY studios in Philadelphia to answer questions posed by Hyde Park Elementary School students about her novel "The Littlest Bigfoot." One sixth-grader wanted to know the story behind Alice’s looks. Elise Small: "How did you come up with Alice's physical traits?" "I think that when I was a girl, and even today, I think that there are a lot of ideas about how girls and women are supposed to look, and what makes you beautiful versus what makes you not beautiful. And Alice is somebody who definitely does not feel beautiful or does not feel or pretty in her own skin or confident in her own skin. "And I wanted to write about a girl like that because I had been a girl like that and think that there are still a lot of girls like that out there. So I wanted to write a story about a girl like Alice, who sort of learns that there are rewards that you get for what your body can do, not just how it looks." Brandon Allen reads aloud from Jennifer Weiner's "The Littlest Bigfoot" so classmates can repeat in a call-and-response activity. One fifth-grader wondered how much time it took the author to develop Alice and Millie's story. Mara Bowers: "I wondered, like, how long it took you to think of this book because it's a very different book, but I do like it." Jennifer Weiner: "I think I had it in my head for about a year, between the time that Phoebe started watching this TV show Finding Bigfoot and the time I started writing." But in that year that the story was taking shape, Weiner says it changed a lot. "And then the focus just kind of narrowed down to Bigfoots because I was interested in the way that Bigfoots kind of echo the way kids feel — where they’re big and they’re clumsy and nobody really understands them and people think they’re hideous — and I think a lot of teenagers feel that way at certain points." Weiner has written more than a dozen books, but The Littlest Bigfoot is her first novel for young people. One sixth-grader wanted to know how the author went about writing it. Shannon Walsh: "What was your process while you were writing this book?" Weiner says she used the same process as when she writes books for adults. She thinks about the characters and starts with an outline of the story, then she gets to writing her first of many drafts. Jennifer Weiner: "So all of that happened and I turned in a draft, and I did not realize that children's books are usually around like 60- or 70,000 words. And I turned in something that was 120,000 words. And so then, my process became pulling the book into three different chunks and reimagining it as a trilogy." The second book in the trilogy is available now. It’s called Little Bigfoot, Big City. Weiner says the third book is still in the works. 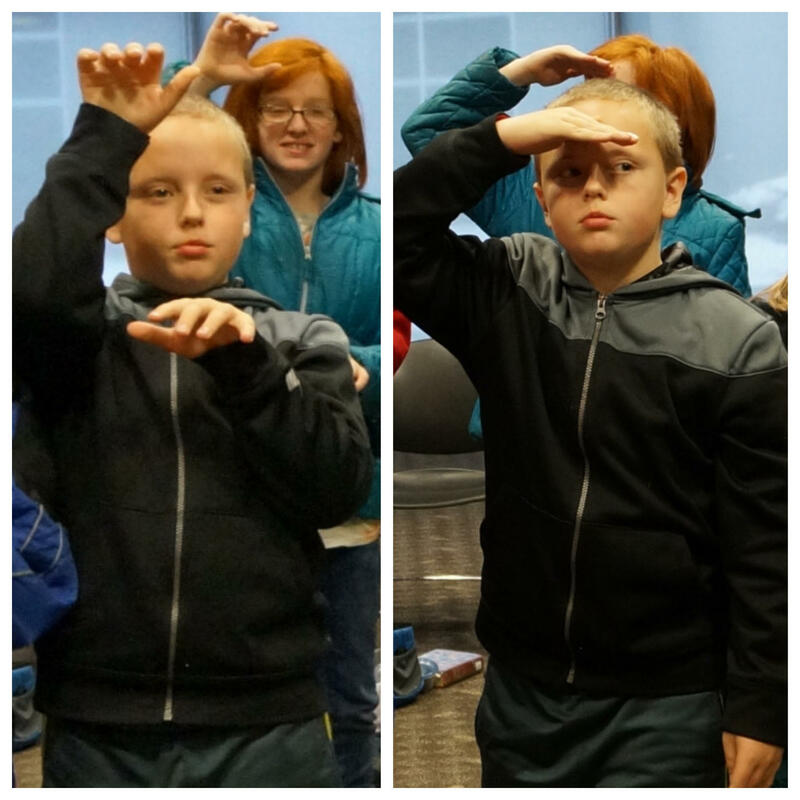 Along with other students, Landon Nolan acted out climbing and then peering from the Lookout Tree, which character Millie does in Jennifer Weiner's "The Littlest Bigfoot." Weiner has been busy creating this Bigfoot world, but one sixth-grader was curious if the author would ever want to live among it. Hope Hoadley: "If you had the chance to be a Bigfoot, would you?" Weiner had to think about that one. Jennifer Weiner: "Wow, huh. I don’t know if I would be a Bigfoot because the things that I like doing – I live in a city and I get to, like, walk around and I go to the market and I go to the movies and I go to the drugstore — and the Bigfoots can’t really do that. So I think that, on the one hand, I would be very frustrated by being a Bigfoot. "On the other hand, though, a lot of the things that they get to do are things that I like to do. They get to sort of live in the woods and they cook and they make things with their hands and they chop down trees and they don’t have to wear coats 'cause they have their coats on them all the time. So, I think that there are aspects of Bigfoot life that I would find quite appealing." Find more episodes of Dorothy's List here. Special thanks to Hyde Park Elementary School Librarian Robin Bryce and Principal Diane Reilly. There aren’t any kids running through the halls of the Hyde Park Elementary School building this fall. Instead, they're being put up at a hotel while their school is undergoing major renovations.